As the UN post-2015 summit in September approaches how does the current draft of the SDGs shape up with respect to nutrition? Asma Lateef, Director of Bread for the World Institute with Jennifer Thompson and Joanna Francis of Concern share their reflections. All are members of the International Coalition on Advocating Nutrition (ICAN). The target to “end malnutrition in all its forms” in the final draft post-2015 Sustainable Development Goals (SDGs) reflects a sea-change since the adoption of the Millennium Development Goals (MDGs) following the Millennium summit in 2000. The international community now understands and is responding to the evidence about the devastating personal and societal costs of undernutrition. It is now clearer than ever that undernutrition in the critical 1,000 days between a woman’s pregnancy and her child’s second birthday robs children of future income and opportunity. It perpetuates the cycle of poverty and inequality. The 2008 and 2013 Lancet Series on Maternal and Child Nutrition as well as studies by the World Bank and the Copenhagen Consensus have documented the most cost-effective interventions and the significant benefits to taking action to prevent or treat malnutrition. In the MDGs, the hunger target was combined in Goal 1 with the target on extreme poverty and the only nutrition indicator was child underweight. Under Goal 2 of the proposed SDGs, to “End hunger, achieve food security and improved nutrition and promote sustainable agriculture”, target 2.2 is “By 2030, end all forms of malnutrition, including achieving, by 2025, the internationally agreed targets on stunting and wasting in children under 5 years of age, and address the nutritional needs of adolescent girls, pregnant and lactating women and older persons”. Including two out of the six World Health Assembly (WHA) Nutrition Targets reflects growing consensus and political support since the first Lancet series. In 2010, the Scaling Up Nutrition (SUN) Movement was launched to engage and consult high burden countries on the human and economic costs high levels of undernutrition in pregnancy and early childhood have on a countries development. Fifty five countries have joined the SUN Movement to date. In 2013, the UK and Brazilian Governments alongside the Children’s Investment Fund Foundation (CIFF) hosted the first Nutrition for Growth (N4G) high level event and mobilized much needed resources to tackle undernutrition. 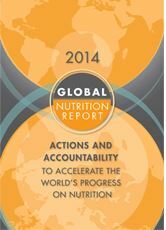 In 2014, the Second International Conference on Nutrition reaffirmed global commitment to the WHA nutrition targets. It further called on the international system and multi-stakeholder bodies such as the Committee on World Food Security to coordinate action across sectors. The SDGs and targets are an important step in the right direction for nutrition. They stop short however of including all six of the WHA targets—risking a focus on only part of the full set of internationally agreed actions needed to sustainably ensure maternal and child nutrition. While malnutrition is included under the hunger, food security and nutrition goal, there is no reference to it under any other goal or target, including the target to end preventable newborn and child deaths (3.2). We know that 45 percent of all preventable child deaths under the age of five are due to malnutrition. The absence of nutrition across the SDGs risks signaling that other sectors such as health and water and sanitation (WASH), are not as critical in improving nutrition as food security and agriculture, and creating siloes when for the first time there is global consensus that it will take a multi-sectoral approach. It is important to recognize that the SDG summit this September does not mark the end of the process. Important discussions are also taking place around how the goals and targets will be measured, a process that will only be completed at the global level in early 2016. In addition, each country will have to develop its own set of national level targets and indicators. The International Coalition for Advocacy on Nutrition strongly calls for the inclusion of all six WHA targets, women’s dietary diversity and sufficient budget allocated for nutrition as indicators and national level targets.